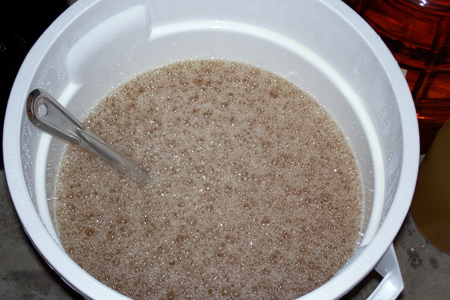 Here’s a photo of the fermenting mead that I wrote about yesterday (and started the day before on 5/5/07). 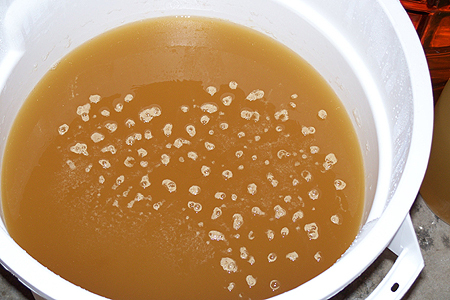 The yeast will do their work without much attention from me, but a daily stir can help. I sanitize a long stainless steel spoon by immersion in boiling water, dip it in cold water so it doesn’t shock the yeast, then give the whole thing a good stir. By doing this, I’m trying to keep the yeast uniformly distributed. If I didn’t, the yeast might settle to to the bottom and go dormant before they consumed all the sugar. This entry was posted in Mead and tagged nad on May 7, 2007 by Erroll.